After what feels like an eternity of an International break which saw the Bento revolution continue to meander along through a throng of meaningless friendlies, it’s time for the K-League One to return to action and with it the crowning of the 2018 Champions as an injury time Lee Dong-gook penalty sealed the title for Jeonbuk in Ulsan last time out. It’s safe to say though that much has changed in the last couple of weeks with the world’s worst kept secret being revealed as Choi Yong-soo returns to the helm at FC Seoul and rather more unexpectedly Seo Jung-won also returns to take charge at Suwon Bluewings, merely weeks after quitting although only until season’s end it would seem. The K-League table going into the weekend. Choi has obviously been brought back to stem the flow of shocking results and save Seoul from the playoffs which is kind of exactly where they looked like they were heading under caretaker manager Lee Eul-yong and it’s his first game back in charge that is this week’s ‘Match of the Day’. Choi’s first game in charge will be the trip to Jeju to face fellow under-achievers Jeju United in a match which even if Seoul were to win by double-figures still wouldn’t prevent them from finishing in the Relegation Group this year. Looking for a standout performer in a Seoul shirt these days in no easy task with only really Go Yo-han and goalkeeper Yang Han-bin earning pass marks across the course of the year. Given the fact that the latter has been inexplicably dropped recently and the former will sit out the trip to the Island paradise due to a red card in the defeat to Jeonnam last time out and the task is nigh on impossible. And so indeed all eyes will fall on the Seoul dugout for inspiration if they are to avoid the worst run of results since re-branding as FC Seoul. 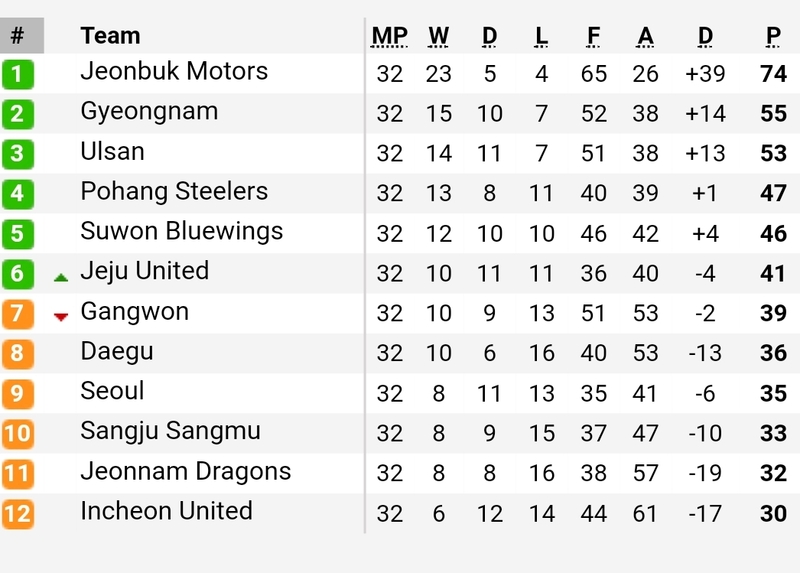 Seoul have now gone nine games without a win with the last time their fans tasting victory away back in August as they defeated Bluewings 2-1. A tactical genius Choi may not be but there do seem to be fewer managers in the K-League who are able to motivate their players to run through brick walls for them like he can. He might need to call on the Gods of motivation to help him over the next few weeks but where better to start than in the shadow of Korea’s own Mt. Olympus, Halla-San. Jeju have not exactly had a stellar season of their own, embarrassed in the Asian Champions League they have fallen to 6th spot in the league and most recently crashed out the FA Cup on penalties to Suwon Bluewings in Wednesday night’s rescheduled Quarter-Final. Out of the doom and gloom though there has been one shining beacon in the form of Brazilian number 99 Tiago Marques (pictured left) who has now hit the net in four of their last five matches including a dramatic 120th minute equalizer in the FA Cup a few days ago. Powerful in the air and skillful on the ground he’s slowly but surely proving himself a handful for most Korean defences and yet again highlights Jeju’s incredible scouting record when it comes to foreigners. With FC Seoul missing the aforementioned Go Yo-han he could find himself with more space than he is used and with Park Jin-po putting crosses right onto his head it could be a busy day for whoever is in the Seoul goals. 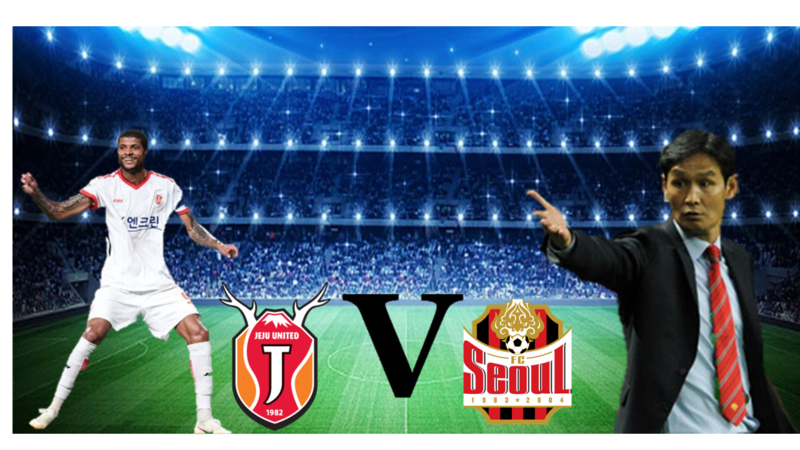 The two teams have clashed a total of 43 times down the years with Seoul having by far the upper hand, in fact it was once considered that Jeju couldn’t beat Choi first time around and although Jeju have performed better of late they must still dread this fixture coming up. They did win the last clash with Tiago sending Seoul crashing out the FA Cup with a last minute winner. You have to go back to July 2016 for the last time Seoul failed to board the plane back to the mainland without at least a point though. With the return of Choi and Jeju having nothing to play for a winning start for Choi would not be a shocker…..but then again this Seoul team are shockingly bad.